IDF warns tourists to take care as thousands flood to Golan to see the snow. Thousands of people are expected to visit the Golan on Thursday and over the weekend to enjoy the snow that remains now that last week’s snowstorm has ended. IDF Lieutenant Roi Gutman spoke to the IDF website about safety while visiting the Golan region. While the region is considered safe despite fighting in nearby Syria, Gutman warned that tourists must take care to avoid land mines. “You need to be aware of the danger. Even when walking on marked paths, there’s a chance that by taking a step in the wrong direction people will find themselves in a mine field,” he warned. 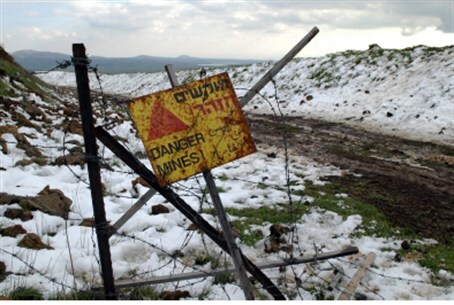 The mine fields in the Golan have been surrounded with barbed wire and marked with yellow signs bearing warnings in three languages. “We made sure to put signs up at double height, so they could be seen after the storm,” he noted. However, Gutman warned, not all mines remain contained, particularly in the area near the fence separating Israel and Syria. “Many people aren’t aware of this, but sometimes wild boars or minor landslides can move mines past the fence,” he said. He advised visitors to remain dozens of meters away from the border fence at all times. If a person realizes they have entered a minefield, he said, “Freeze in place. Don’t put anything on the ground. Call for a rescue team immediately.” Civilians can call police, who will bring in IDF teams, he said. There are warning signs if one enters a minefield, he added. “Mines mostly look like brown plastic objects, like a box, or a little soccer ball,” he said. Land mines were put in place in the Golan during past hostilities. Earlier this year a soldier was killed in the Golan while clearing land mines, and three years ago a boy who was visiting the region with his family lost his leg after stepping on a mine. In 2011 the Knesset passed a law requiring land mines in the area to be removed.